Dentures are one of the oldest tooth replacement options ever, but they’ve only gotten more and more natural-looking over the years. Made from an acrylic base and porcelain teeth, dentures are a quick and affordable solution for tooth loss, especially if you’re missing an entire arch. Of course, you can also have a partial denture made if you need to replace multiple teeth and a traditional bridge just won’t do. Once you’ve gotten used to wearing them over the next few weeks, you’ll be able to smile and eat a balanced meal without much issue. With that being said, dentures do require more maintenance than other replacement options. After several years of wear, they need to be relined in order to properly fit your mouth as it keeps changing shape. That means their long-term cost will increase over time as you regularly reline and eventually replace them entirely. Dental implants work to replace your entire tooth structure, including your root. That means implants bond with your existing jaw bone, creating an incredibly sturdy foundation that stimulates bone, promotes blood flow and helps you retain your fullest biting force. They’re also the most aesthetically pleasing, long-lasting and durable solution to tooth replacement in dentistry to date. However, these added benefits come at a much higher cost. People who don’t have enough bone volume or healthy gum tissue will need preparatory treatments in order to become viable candidates, therefore increasing the cost more. They also require oral surgery and several months of healing time before they’re complete. 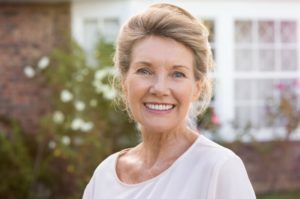 While the differences between dentures and dental implants in Casper are very clear, that doesn’t mean there is no middle-ground solution between the two. A great example of this is implant-retained dentures, which utilize several strategically placed implants and an overdenture that snaps on top. This can be either a fixed or removable prosthetic and customized to fit your mouth exactly. When it comes down to the decision you make, the main differences are going to be the functional benefits you require and the price you’re willing to pay. If you have more questions on the right replacement option, schedule an appointment with the dentist today! Dr. Erin M. Prach earned her dental degree from the University of Colorado School of Dental Medicine. Since then, she’s expanded her expertise in oral surgery and the creation of implant-retained restorations. To learn more about her practice, schedule a consultation by contacting her through her website!